The Blaze announces the 10 freest states and the 10 least … which one doe you live in? In order to calculate these scores, they weight public policies according to the estimated costs that government restrictions on freedom impose on their victims. The fill report can be read here, at “Freedom in the 50 States”. 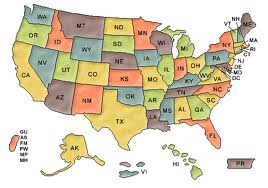 Many of the most free states are so because of low taxation and fiscal policy. North Dakota was named the most free, New York state comes in dead last. The 223-page report “scores all 50 states on their overall respect for individual freedom, and also on their respect for three dimensions of freedom considered separately: fiscal policy, regulatory policy, and personal freedom,” the study explains. Surprisingly, Texas did not make the top 10 and was ranked the 14th most free state. The bottom 10 are 41. Mississippi, 42. West Virginia, 43. Vermont, 44. Maryland, 45. Illinois, 46. Rhode Island, 47. Hawaii, 48. New Jersey, 49. California and 50. New York. I live in SO. CA. Believe it or not there was a time when CA. was a wonderful place to live. Jane – I was born and live in California, been to many states but no place I’d rather live than here! I still love it. Jayne and Klaas, CALI is a beautiful place, it is just to darn expensive to live for too many people. The cost of living, the out of control taxing is driving many to leave. The same is happening in NY & NJ. Actually many northern states, MI,IL, OH and PA are losing their citizens to the South and the Southwest. I was born and raised in New England and it is one of the most beautiful places in the country, but the damn politicians ruined it by taxing everything that moves. Heck, in Maine and Mass the saying is … “where they will tax your dreams too”.